MightyX Anabolic Mass Gainer is a perfect blend of whey protein and milk Protein; fortified with Glutamine, Minerals & Vitamins; all of which would provide essential Nutrition for maximum Mass Gain and lean muscle Growth. It supports endurance, recovery and general health with amino acids coming from its rich protein blend. 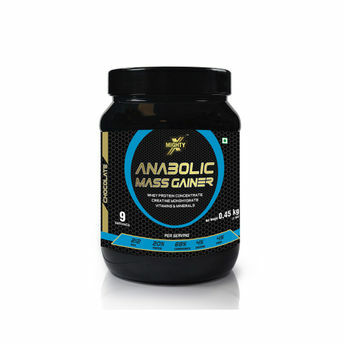 MightyX Anabolic mass gainer has high energy glycogen support & low glycemic index formula. It contains Lactase & Protease digestive enzymes to aid digestion & enhance metabolism. Also contains Glutamine & its precursors, which supports lean mass gains, recovery & immune system function. It has BCAAs (Leucine, Valine & Isoleucine) which support repair & growth of cells. Explore the entire range of Lean available on Nykaa. Shop more MightyX products here.You can browse through the complete world of MightyX Lean .Alternatively, you can also find many more products from the MightyX Anabolic Mass Gainer Chocolate Powder range.